A guide to that most American of grapes and infidel of wines, Zinfandel. Here are some links to my new venture though, which is keeping me busy. intense flavors and aromas in this Zinfandel. I think if I bought this wine in a store or restaurant outside of California, I'd think it was pretty darn good. But the levels of some of the zinfandels I've been drinking is so incredible that this affordable zin with good strong fruit doesn't come out as exciting as a few of the "whoa" zins I've been tasting. Here on the edge of the California Delta, windmills have harvested energy from the ocean breezes since the arrival of our forefathers. These same breezes caress our vineyards and provide optimal growing conditions for these fine wines. This single vineyard zinfandel is produced from a premium Oakville vineyard adjacent to Michael & Mary Ann Pozzan's Napa Valley Home. Enjoy! All and all this was a decent zin, perhaps it could benefit from a bit more age (being a 2006), but it didn't blow me away like many of the wines on this blog. When I first saw this wine in a store, I couldn't believe someone made a wine with a bright orange label that looked just like a pack of Zig Zag rolling papers, and that they would even call it Zig Zag and put the words "Qualitie Superieure" on the bottle. Well, the lawyers must have thought better of it, because the Mendocino Wine Company changed the label to a more conservative, non-trademark infringing version with the next vintage (the 2004, pictured here). Still, this is certainly an "infidel" zinfandel, full of fruit and very drinkable. Mendocino makes some great wines, and the Mendocino Wine Company are the folks responsible for Parducci and Zingaro Zinfandels, so they know what they are doing. Screw cap too, which is convenient but is taking much longer to catch on here in Northern California than in Australia or other places. Mendocino Wine Co. is fermenting a business revolution right here in Mendocino County, where grapes are the second crop and sustainability is a way of life. We're GMO free and bio-diesel friendly. Please leave your cell phone in Napa. Dark, complex, mouthfilling, and rich, our 2005 Dry Creek Zinfandel is a classic example of why the Dry Creek Valley is so famous for intense zinfandels. The combination of black raspberry and chocolate flavors, combined with its velvety texture, make this a perfect wine for a wide variety of foods--from barbequed or grilled meats, to pastas with hearty sauces, or just by itself before a meal. 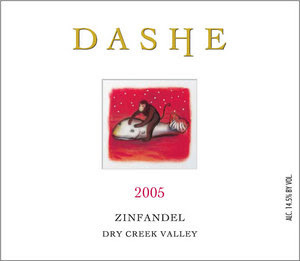 This is the wine on which Dashe Cellars has made its reputation, and the 2005 vintage is so good that you'll find it absolutely irresistible! Robert Parker gave this wine a 90 point score for the 2004 vintage, and we expect an even better response for the spectacular 2005 vintage. This is a zinfandel that you will either love or hate. Very intense, sweet, and with a heck of a lot of alcohol (16.1%! ), at first taste it almost seems more like a port. I discovered these guys last year on a trip to the Central Coast, and have been impressed with the wines. I actually prefer their less expensive Summit Mountain Zinfandel, which was available in quite a few grocery stores around the central coast (and will be the subject of a future review). Opolo Vineyards makes zinfandel that, love it or hate it, expresses the true beauty of California Zinfandel while it hits you squarely between the eyes with its over-the-top fruit and huge alcohol content. Any zinfandel wines sent to zInfidels! will be reviewed (and shared with friends). We promise!